I had already planned to travel down to Houghton festival even though I wasn’t due to perform. 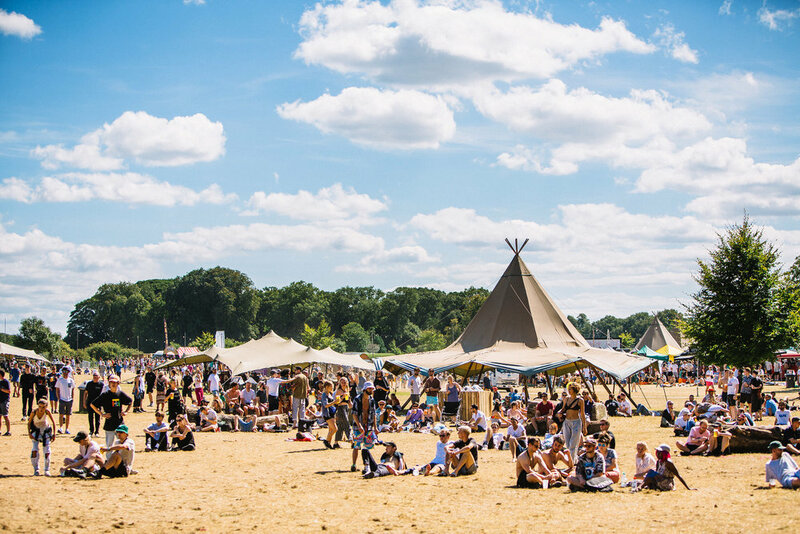 Out of all the summer festivals it looked the most interesting with a special line up, beautiful location and the promise of long sets from the artists. Then the week before the event a text message popped up on my phone from Craig Richards asking if I could play last minute. I replied that, “I’d love too,” of course, and a set time of 8-11pm on Thursday in ‘The Quarry’ got sent to me. The festival was only due to open that evening so I was one of the first people on site. The torrential rain we’d suffered the day before subsided and the sun made it’s first appearance in nearly a week over the trees of the Houghton estate, as I arrived. I found Craig up a cherry picker painting some giant red abstract faces on large white hoardings, not the usual place you find a DJ. Just minutes before the festival was due to open, there he was, with red paint splashed all over his brogues. He came down from the cherry picker in one piece to welcome me. If he was nervous he wasn’t showing it and he took me to see the nearby Quarry. The good thing about Quarries is that they are shaped like amphitheatres. Digging out the earth and rocks leaves high walls surrounding a flat bed, often in a circular shape. Without ever considering it, the excavators had created a huge dance-floor with bankings that absorb sound waves with little reverb and shelter from them being lost in wind. In short, they’d created the perfect environment for an outdoor stage. The first of the series of coincidences that would define my time at Houghton happened straight away. The production manager turned out to be an old friend of mine from the Smokescreen collective who used to throw parties around the Midlands and Yorkshire. Along with D.I.Y sound system they would throw, usually illegal, raves, often in quarries. I managed to play at a couple of really good ones for them and it immediately felt to me like I was back there again. Although everything at Houghton was fully licensed and above board the festival still managed to retain the feel of the illegal parties that captured the true spirit of the acid house subculture to me. People often ask me what is different now compared to back then and I always answer that I miss the feeling I got at those parties. It felt special to be involved in a scene with depth, substance and meaning. The parties were expressions of diversity, creativity and equality. They also stood for a way of life that refused to fit the norm. I feel somewhere along the way we lost all those things. Many of the Smokescreen and D.I.Y crew were travellers, living on the road all year round, meeting up in secret locations on a weekly basis to let their hair down at the weekend. As usual with the first edition of a festival the production team were still running around getting everything ship shape as the official opening time approached, so the health and safety officers could pass the site fit. I could see more and more people building up behind the gates as the opening time came and went. Then another hour passed and another. There was some wood that still needed to be cleared from the forrest stages so it was decided that area wouldn’t open until the next day. Once that decision was made the site was passed safe and the gates opened just minutes before 8pm, when I was due to play. I had imagined that I would be playing a warm up set as people came in, but the build up of people outside the gates meant that instead of a steady flow there was a surge of people rushing in when they opened. The result being that the site went from being empty to packed in a really short space of time. The slow warm-up set I had planned went straight out the window. After many years in the music industry I have concluded that nearly everything is determined by luck. I have seen hugely talented artists get absolutely nowhere and DJs that couldn’t mix a vodka and orange take their jobs. Some of the best DJs I’ve ever heard have given up their passion for music simply because they couldn’t make a living from it. It’s far more important to be in the right place at the right time. I must admit I’ve had my share of good luck, especially when starting out. I just happened to be one of a few DJs playing house music in Leeds when offered a residency at back to basics, none of us had any idea it would last so long. But more often than not I’m the unlucky one. I’ve lost track of the amount of times a promoter’s told me, “you should have been here last week, there were thousands of people here” as I look out over an empty dance-floor. At Houghton that luck changed, it all dropped perfectly in my favour and the beauty of it was I wasn’t even supposed to be playing. As the other side of the site remained closed The Quarry became the epicentre of the festival and people just kept coming and coming until they were everywhere in my line of vision. 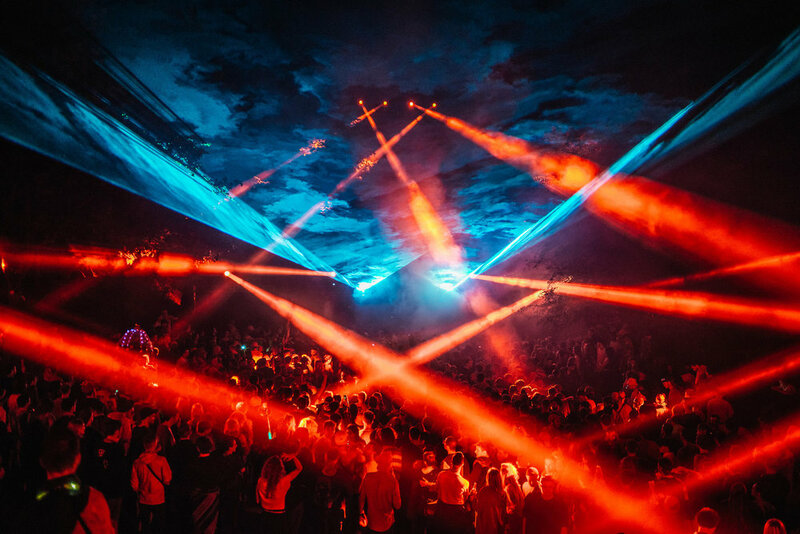 As darkness crept in The Quarry was lit up with a red glow and lasers pierced the clear night air. The sound out front was truly superb given the natural acoustics but the hut that housed the booth was rattling and shaking with every kick drum. It made mixing trickier but it also gave me a flashback to the>music:factory, the first home of back to basics, where the DJ booth was situated in the cab of a truck that also shook with every beat. Just as I felt things were peaking nicely I saw several hi-vis yellow jackets running towards me. “Shut the Music Down” shouted the leading security guard. I decided it wasn’t the right time to question him and faded down the music. Basically, the surge of people coming into The Quarry had worried security and they wanted to thin the crowd out. I have often had the music cut out while playing. In fact at back to basics we seemed to specialise in it. I remember the whole club getting evacuated due to a faulty fire alarm at the>music:factory and everyone dancing in the street while they waited to get back in. More often than not blackouts involved the promoter Dave Beer. He once booked an Elvis impersonator to perform whose PA blew out the fuses and cut all the sound. Then there was the time right on the stroke of midnight that I was told to turn the music off to play the countdown bells from Big Ben, only for them not to work with the whole club left in silence. No one had a clue when midnight happened. In the immortal words of Douglas Adams - DON’T PANIC. The best thing to do is to use it to your advantage and realise you have just been given a golden opportunity. But there is a perfect amount of time for the music to be off. If it goes on too long then you’ve lost them. Every second seems like a minute and every minute seems like an hour. Things were getting a little heated between security and the stage manager and it was approaching the cut off for an acceptable amount of time in silence. I finally got the nod that I could play again and decided to start with the same track that had been playing before, giving the added effect of a classic DJ rewind. After the music comes back on you can do no wrong. Everyone has lost the last of their inhibitions and they are just happy to have the music on again. There’s no way you can achieve that kind of crowd pick up with a single mix or record, you need to use what appears to be bad luck to your best advantage. When I listened back to the recording this meant that there is a gap of silence. I did consider editing it out but decided I wanted to keep the recording live. I’ve got a party trick for you. Try listening to the gap and guess how long it is. My bet is that you overestimate the amount of time of silence. Imagine that amplified by several thousand in a live situation. People asked me what record was playing at the time, Paperclip People - The Climax. You honestly couldn’t write a better script. And that was just the start. From that point on my time at Houghton was nothing short of epic. I didn’t have a single bad minute. 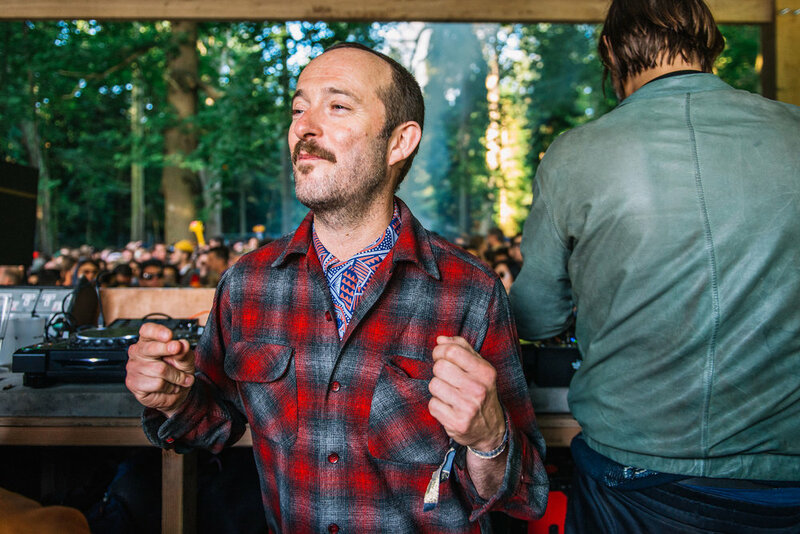 Everywhere I went I was greeted with incredible music from the cutting edge of the world’s best electronic music selectors in the most beautiful locations. One moment I found myself deep in a forest rave and the next I was transported to the loft in New York City, complete with authentic circular stacks of Klipshorn speakers. But the most important aspect of the whole festival was the feeling it generated in so many people. It felt like we had reached a turning point, both individually and in our scene. From this point on things would be alright. We all departed in different directions but left inspired with common goals. Once again there seemed to be a point to the years and years I’ve dedicated to the art of electronic music. And I wasn’t alone in feeling like that. Since, I’ve had many conversions with a diverse range of people with very different ages, who all felt something special happened at Houghton. Far from being a festival for tired old ravers I found the next generation, and with them I found hope. I was really pleased to record the session and it's available below with track listing. If you like a record please make sure to buy a copy and support electronic music artists.